Fatima Wehidy came to CrossFit 718 looking for a new type of workout and some built-in accountability. She’d never tried CrossFit (or even touched a barbell), so she started from scratch, developing new skills and tracking her steady progress. She quickly found that she loved her results as much as CrossFit’s supportive and social environment. In just one year, Fatima has gone from New You newbie to Athlete of the Month! These days she’s setting PRs left and right, and the coaches consider her one of the best rowers in the gym. How did she achieve such astronomical growth in less than 12 months? You’ll have to read our Q&A with Fatima to find out. I was looking for something to help me get in shape and saw an ad for the New You program. It seemed perfect for a beginner and turned out to be exactly what I needed. I have learned that I won’t stick with a workout routine unless I have scheduled classes that I am held accountable for attending. I love the structure of CrossFit. I also like being able to quantify and track my progress. I especially love CrossFit 718 because the coaches are all amazing and the environment is fun and social. I came in completely green, not ever even having touched a barbell, and can’t believe how far I’ve come. So, that is also motivating. Your boyfriend also does CrossFit. How does that impact your workouts and overall experience? My boyfriend used to play football in college and was also looking for a new way to get back in shape, so he actually joined CrossFit after I raved about it to him. It has been great for our relationship because we can talk about our workouts and progress and really understand that part of each other’s lives. So, I feel like it enhances the overall experience. I do it on my days off and before work during the week. I bartend long hours over the weekend, so I usually take Saturdays and Sundays off of CrossFit. And I’ll often do yoga with my boyfriend on Sundays. I find yin yoga is a great compliment to CrossFit. 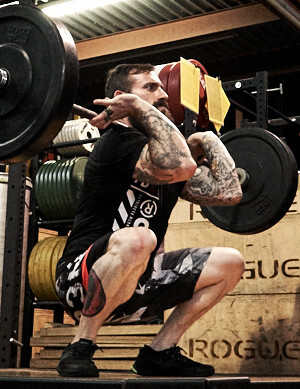 What’s your favorite lift or WOD? I love deadlifts because it feels great to move a lot of weight, but I also love anything conditioning/endurance related because I like to see how far I can push myself. I recently PRed my back squat at 170lbs. I had been stuck at 165 for a while before that. I would love to have functional upper body strength. I struggle with any lift/movement that requires me moving or holding my body weight with my upper body. So I’m working on pull-ups, push-ups, rope climbs, and getting inverted. 5:45, but scaled with ring rows instead of pull-ups. Tammy mentioned that you’re one of the best rowers at the box. Do you have any tips you can share? I think I am good at rowing because of my lower body strength, long arms, and endurance. My biggest tip to anyone who struggles with the endurance aspect of rowing is to try running long distances. I’d recommend starting out with a short run and intersperse it with walking if needed, and then gradually increase that distance over time. Running over three miles at a time is great for endurance. As for rowing technique, push with your legs and try to recover with your arms first. Those technique tips from Tammy really helped me. I currently bartend at a Tim Burton themed bar in the east village for work, and have been bartending and managing bars for 14 years. When I’m not working or at the box, I have tons of hobbies, including making kombucha, making soap with my sister, cooking, yoga, and outdoor running. I also love to travel and often take trips to Florida and California to visit friends and family.